Guest blogger Luke Watson is here this week to cover the Masters. Read his first post here. -Ed. The Masters is known for many things but probably the most delectable item is the pimento cheese sandwich. Now, I’m typically just about hot dogs and golf, but once a year I think it’s important to take a closer look at the snack that’s quickly making its way to parties all across this glorious land. 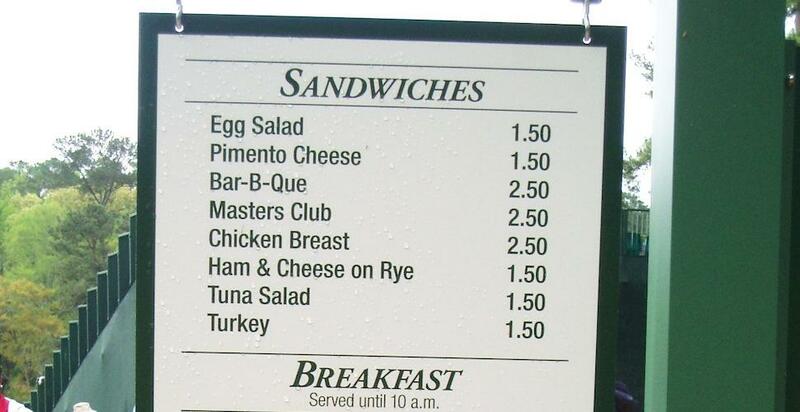 The Masters, apparently, has some mighty fine pimento cheese sandwiches. And, for a dollar fifty, it’s a heckuva deal. Those I’ve talked to tell me that they have a little more oniony kick than your typical southern style PCS, but they’re a great break from the sometimes awful heat and humidity. Coronas are a good option, too. Now, they come pre-made but I don’t think that’s all that awful — you’re there for the golf, not the freshness of the sandwich. I’ve always said that if Old Crow whiskey is good enough for Ulysses S. Grant, it’s good enough for you. Same goes for pimento cheese. As a matter of fact, my favorite PCS recipe comes from Martha Stewart. It’s the Tabasco that does it. And, if Mrs. Stewart and the members of Augusta National Golf Club are fans, it’s fine for you to be one as well. I brought some pimento cheese spread to a party a few weeks back. People were skeptical at first, until they tried it. And then they were all over the stuff. Made me proud. It’s definitely going to be a go-to for parties I attend in the future. On the course, aside from a hotdog, it’s a fantastic choice for a mid-round snack. It’s benefits are many: it’s filling; it’s tasty; it stays together really nicely; and it can be scarfed down quickly. It’s a pretty packed leaderboard. So far, my picks are doing ok. The leaders are at -6. Who are they? It’s Sergio Garcia and Marc Leishman. It should be known that I have Sergio Garcia as a pick in my office pool because someone else picked Rose. This entry was posted in ALDLAND and tagged dustin johnson, golf, ian poulter, jason dufner, justin rose, lee westwood, marc leishman, masters, sergio garcia, texas by Luke Watson, special to ALDLAND. Bookmark the permalink. Luke, the pimento cheese that you’re eating @ the Masters is a recipe that is ‘borrowed’ from the Palmetto Cheese pimento spread made by some folks from Pawleys Island, SC. Their product can be found at most grocery stores and Costcos nationwide. It’s truly addictive!